There are below some further detailed information expanding on questions you may have if you are considering studying this degree. What career opportunities are open afterwards? One way to find out more about the course is to come along and try it out for a day, sometimes referred to as shadowing . We arrange for you to attend lectures and labs in the company of current students. You can chat to current students and they will guide around the place. There should also be some time to have talk with one of the lectures closely involved with the course to answer further questions. There is no designated 'shadowing day' as such; if you are interested, just get in contact with us and we will work out a mutually suitable day. In an increasingly technological and multilingual world, the computer science and language abilities of CSL graduates make them attractive to employers, as do their proven analytical skills and not least their self-sufficiency and maturity in having spent a year abroad. 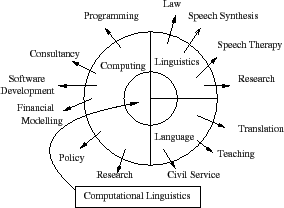 Linguistics is the name given to all aspects of the scientific study of language. Everyone is very familiar with at least one language, almost over familiar. It turns out then when one stands back and looks scientifically at not just one's own language but multiple other languages also, remarkably intricate structures and regularities emerge. For example, concerning the sounds of language, there is universal repertoire of sounds, the International Phonetic Alphabet, allowing description of all spoken languages, and general rules that can be formulated concerning how these sounds relate to how human being manipulate a flow of air and how these sounds are modified in particular contexts. Concerning the syntax of language, subtle parallels emerge between different languages, both what they permit and what they do not. other issues looked at in linguistics include: the relation of word and sentence syntactic structure to its word and sentence meaning, the relation between syntactic structure and pronunciation, the developmental stage at which a child might say a given sentence, and many others. There is an excellent textbook on linguistics, many parts of which can be previewed via Google's book's service Linguistics: an introduction to linguistic theory . The introductory chapter of that book would be an excellent place to look. The book The Language Instinct by Stephen Pinker is an accessible account of some these issues, was a bestselling paperback and is quite likely to be in your local library or bookshop. Put another way, its about the scientific description of linguistic intelligence, and its computational realisation. 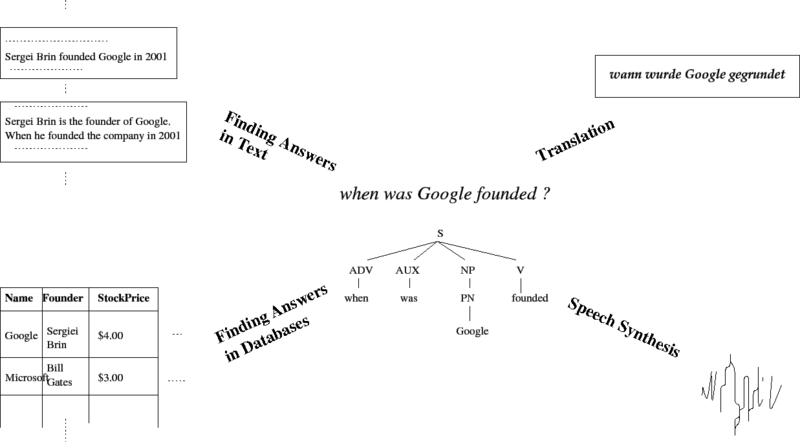 Thus in the centre of the picture above there is a very simple structure for the sentence when was Google founded ? There is listing of potentially relevant job-offers that is maintained for CSL students. The following link is an archive of that listing.